Are you offering cloud storage solutions to your end-customers? You could be, and given the potential, we reckon you should be. In the past 5 years software-defined storage (SDS) platforms like Ceph and Swift have evolved dramatically; today they are redefining the cost of durable, shared storage infrastructure delivered at enterprise-level SLAs. SDS can be used as the foundation of a cloud storage offering, and Canonical is actively supporting service providers delivering storage at a cost competitive with the global giants. Out of all cloud services, storage is special in that it can be utilized in practically any application, regardless of class and operating environment. Any user can benefit from more disk space: backups can be kept for longer, ephemeral content can be retained for analysis, and more files can be manipulated locally. Furthermore, consuming storage is done through common, industry-standard interfaces like iSCSI, NFS, SMB/CIFS and S3 or Swift, which have good support across a wide range of platforms and applications. An important difference between today’s software-defined storage technologies and previous software-based NAS and SAN products is their inherent scalability. The technologies Canonical has on offer provide essentially unlimited capacity. Every SDS deployment starts with a cluster of servers with disks directly attached. As additional storage servers are added to a cluster, more space is made available. And the server systems required are themselves absolutely no-frills: any standard server with commodity hard drives can be added to an existing storage cluster, removing the cost associated with specialized high-end hardware. Servers of different performance characteristics can be used to provide special performance tiers from the same cluster, and the mechanisms to provide durability — replication, erasure coding, cross-cluster synchronization — are also configurable in software. In fact, once deployed the main responsibility of an operator is to manage and grow the existing deployment, rather than designing a new solution for each new project. In summary: storage requirements grow practically unbounded, and users need reliable infrastructure to hold their data. Software-defined storage is the only cost-effective way to deliver cloud services that fulfill that demand. 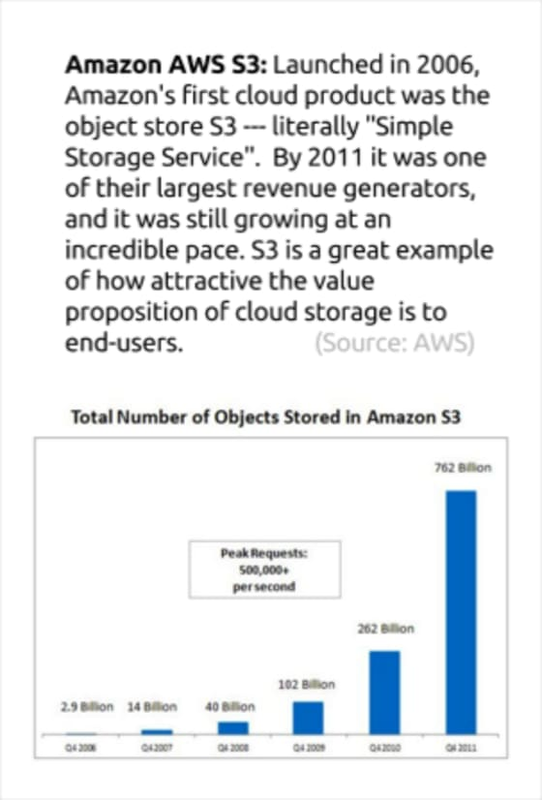 Of the various existing storage interfaces, object storage provides the most immediate value proposition for a public service provider, as exemplified by Amazon S3’s unbelievable success (see box image above). Object storage is a relatively new approach: based on web APIs, it provides very simple mechanisms to store and retrieve arbitrary files of any size. Files can be grouped in containers, tagged and configured with different durability requirements. See this great Rackspace blog post for a more in-depth overview of cloud object storage. Canonical launched Ubuntu Storage at the OpenStack Summit in 2015. Rather than focus on a one-size-fits-all technology (which some believe doesn’t exist), our approach is to provide a variety of software-defined software platforms, each of which bring different features and strengths. Canonical provides commercial support, tooling for deployment and management, and ultimately the expertise necessary to stand up and operate SDS effectively. Ceph, an open source converged storage system offering block and object storage services. Ceph is open source and fully supported by Canonical; pricing is based on the amount of content stored, and starts at 1.4c per GB per month. NexentaEdge, a modern scale-out block and object storage system developed by our partners Nexenta which offers inline de-duplication, compression and copy on write out of the box. NexentaEdge is perpetually licensed and priced starting at 0.55c per GB per month, with 3 years of support included. Swift, an object storage system developed as part of OpenStack, but which is being increasingly deployed stand-alone as a cloud storage service. Swift is open source and as with Ceph, priced at 1.4c per GB of content per month. SwiftStack, a commercial product from SwiftStack Inc. which combines Swift with an advanced controller and a data ingest gateway. Quobyte, a data center file system with high-performance file, block and object storage capabilities. It is available starting at USD 1500 per month. All of our storage technologies are fully deployed and managed with our modeling and automation tools MAAS & Juju. We’re working hard to bring online additional technologies, so watch our Storage page and the Juju Store’s storage section for new additions. Public/private object storage services: delivering a metered cloud storage API by deploying one of our object technologies integrated with your metering and billing portal. Your customers can store and redistribute a variety of content, and archive long-term data without having to deploy any infrastructure themselves. This is a model that many service providers have explored successfully. Off-site backup services: every business needs an off-site disaster recovery datastore. By hosting an object storage service and providing an S3-compatible enterprise backup option to your customers, a number of backup use cases can be directly addressed. You can even offer virtual tape services; see how one provider is doing this with Bacula on AWS today. Our partner Swiftstack has an in-depth guide to cloud backups that covers this in more detail. Additional VM and host block storage: providing additional block storage capacity on-demand to existing virtual machines and bare-metal servers. Ceph, NexentaEdge or Quobyte all provide block services with different features and performance characteristics, and typically have a management interface which simplifies the creation of new pools and volumes. 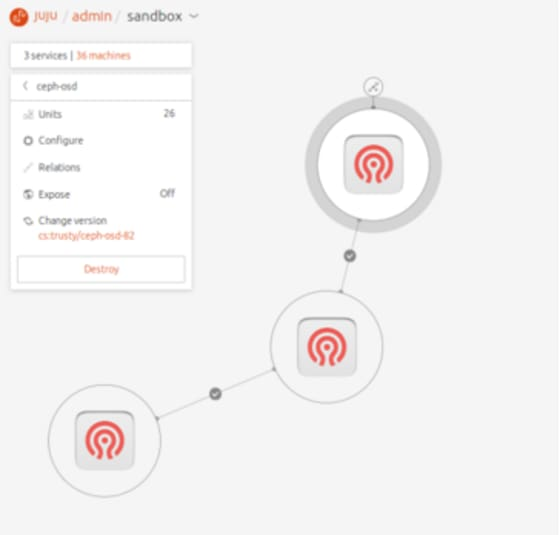 By integrating the block storage interface with your deployment portal you can transparently allocate drives to VM hosts; they can also be made available to directly attached to Linux dedicated servers. Canonical has a very successful history of working with service providers to enable them to address new customer demands and expand to new markets. We work with partners worldwide to do last-mile integration of our technologies with existing infrastructure. At World Hosting Days next week in Rust, Germany three of the most illustrious, Fairbanks, StackVelocity and Teuto will be presenting with us and meeting with hosting companies that are taking the next step in the infrastructure revolution. Get in touch to join our service provider focused channel programme and build successful clouds together.